After dodging a few patches of ‘pois on oak’, we came upon our first shopping list item: Stinging Nettle. Stinging nettle is appropriately named. Wear heavy gloves if you plan on handling this plant. Don’t even think about breaking it off with your hands. We used clippers and either paper or plastic baggies to handle the stuff. Why? It stings. Painfully. And for a few hours. Next up, we found a nice patch of elderberries. They were sweet and delicious right off the tree, but we loaded up a baggie of these berries and carried on thinking of all the uses for these sweet treats. 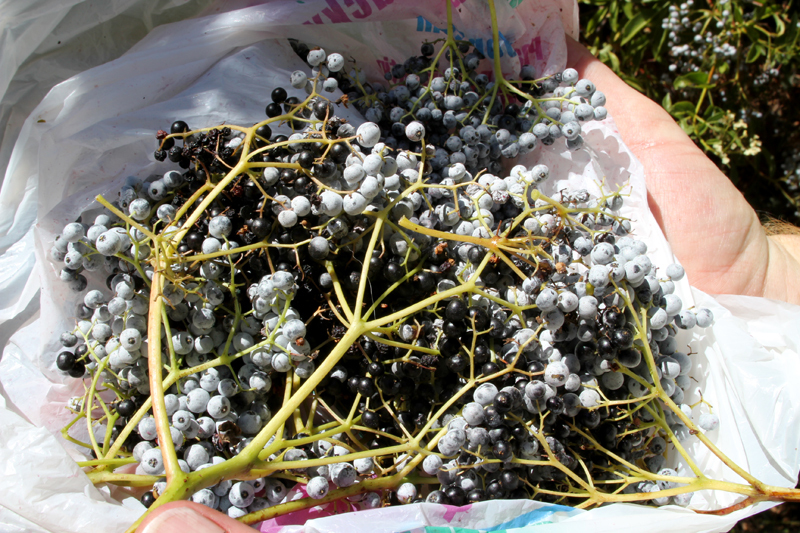 After a few other items, mustard seeds, Toyon leaves and lemonade bush berries, we were set. We picked up a whole perch at the fish market, and headed home to work on our menu for the evening, which included the following: Cream of Nettle Soup, Charcoal-Grilled Perch, and a Smoked Pork Pancake. First, I started prepping the nettles for the soup. 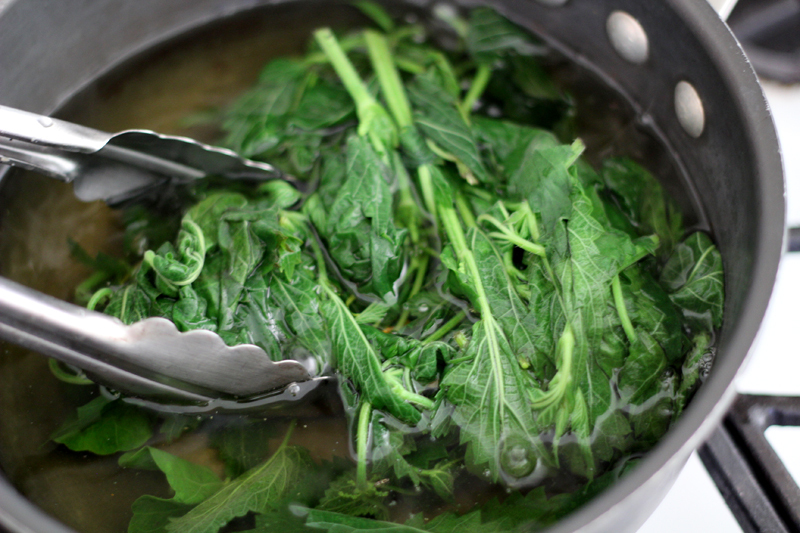 Rinse and blanch the nettles, then drain them well. Bring the vegetable stock to a boil and add the nettles. In a separate bowl, add the flour with a little cold water to make a paste, then boil for several minutes until slightly thickened. Add the cream. Season with salt, pepper and thyme. 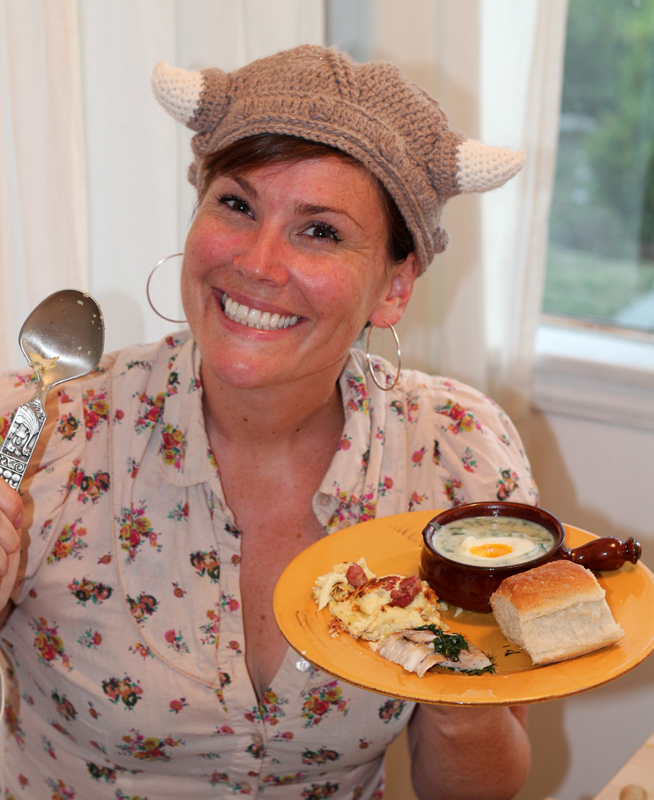 Hard-boil the eggs and place two halves in each bowl. Serves 4. Meanwhile, we soaked the elderberries in a large bowl of cold water. 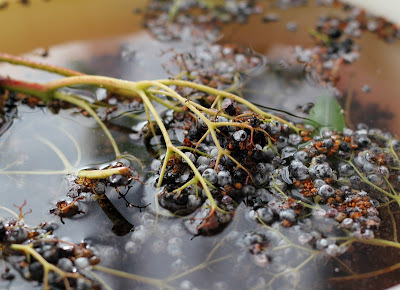 This helped separate the dried up berries and ants that floated (or frantically swam) on the surface, from the sweet, supple berries that sunk to the bottom of the bowl. We mashed up half of the berried in a strainer to make a sweet and tart juice concentrate that we added to fizzy water for a refreshing beverage. With the second half of the berry bowl, we made a syrup to pour over ice cream, and a quick jelly that we ate on toast the next morning! Next up, we prepped the perch and the grill. Gut and clean the fish thoroughly. Sprinkle with salt and pepper both inside and out. Mix the butter and herbs together and refrigerate for a few minutes to harden up. Then, pack the fish with the herb butter. 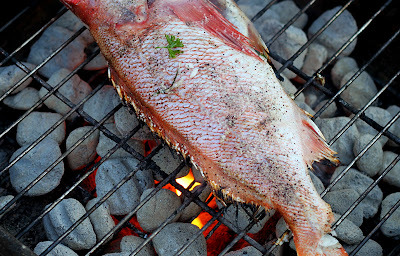 Grill it over charcoal, 8-12 minutes on each side depending on the thickness of the fish. Our fish had been cleaned and de-scaled at the market, and in hindsight, we probably would have left the scales on, because I’m guessing those scales protected the fish from falling apart on the coals in the days before aluminum foil. Half-way through the cooking, we wrapped that bad boy in foil so that we wouldn’t lose any meat to the fire. Lastly, we made a smoked pork pancake. Slice the pork and fry it lightly. Keep half the pork fat in the pan. 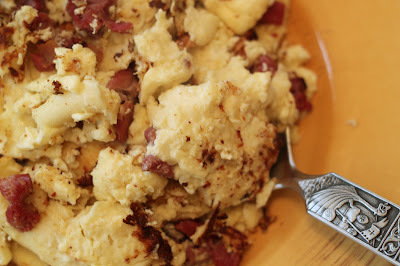 Whisk together the eggs, flour and milk and pour the batter into the hot pan. Lift and prod the batter with a spatula from time to time to stop it from sticking to the pan. When the pancake seems firm, slide it onto a plate. Put the pork back in the pan with some of the fat, and then slide the pancake (uncooked side down) back into the pan. When golden brown on both sides, serve with jam. I had some trouble removing my pancake from the pan, so it ended up looking a bit more like scrambled eggs. Despite the ugliness, it was still tasty. We washed the dinner down with our elderberry fizzy water, some lemonade berry lemonade, and after dinner, a fragrant, but subtle-tasting Toyon-leaf tea! 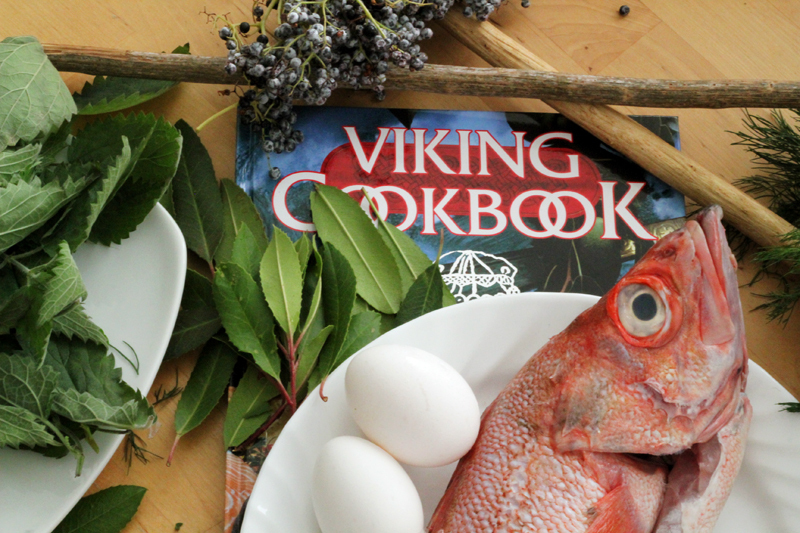 Our foraged Viking dinner was great fun to cook and eat, but the collection was the real treat for us. The hike was beautiful, and thanks to our knowledgeable friend Ivan, we knew we were not gathering anything poisonous… I do want to say, that if you are NOT sure what you are gathering, don’t eat it! There are lots of places that offer local guided tours as well as information in books and online about identifying local wild edibles, and their terribly toxic counterparts. That said, I hope you will enjoy these Viking recipes and let me know what you think!! P.S. If you are curious about the crochet viking helmet I’m wearing, I bought a pattern from Tara at Easy Makes Me Happy and begged my mom to make it for me (since I only know how to knit) before I went to Norway! Check out her other patterns too- all very cute! This sounds like so much fun! I’ve been wanting to go foraging for a while with my friends but we have been too busy. I hope we get a chance to do it this summer as there is plenty of elderflower blooming and raspberries growing along the canal. Ahhh thank YOU for the comment elisa! Glad you have had this on your to-do list as well! Enjoy!! love, love, LOVE that you did this! I’ve been wondering about the flavor of stinging nettles, share? i once brushed up against a bush and man o man did my hand sting for the rest of the day. YOUCH! also? never heard of lemonade berries…intrigued! Thanks JEK! Nettles were yum! Like spinach or chard WITHOUT that strong iron-y bite! Just a really nice mellow green. Super tasty, no aftertaste, and all around delish! Just had to boil away the sting first!